Controlling Soil pH with a Grass? This is an intriguing article that popped up about how to improve blueberry production in alkaline soils. High pH soils are a major issues for many of our tree crops along the coast. pH is what controls the availability of most plant nutrients and what bacteria and fungi grow in the soil, creating the biosphere. 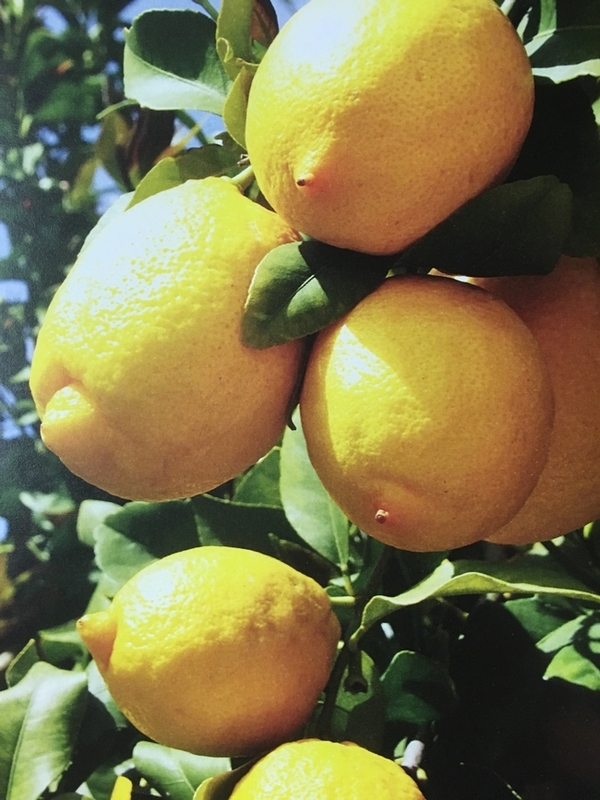 So can growing a grass cover crop in our orchards improve lemon and avocado production? Intercropping with grasses is an effective and sustainable alternative to chemical treatments for maximizing blueberry yield and antioxidant content in limey soils. Blueberries are prone to iron deficiency - and correcting it increases their health-enhancing antioxidant content, researchers have discovered. Published in Frontiers in Plant Science, their study shows that growing grasses alongside blueberry plants corrects signs of iron deficiency, with associated improvements in berry quantity and quality. The effects are comparable to those seen following standard chemical treatment - providing a simpler, safer, cheaper and more sustainable strategy for blueberry farming on sub-optimal soils. All soils are rich in iron, but nearly all of it is insoluble. "Most plants get enough iron by secreting chemicals that make it more soluble," explains senior study author Dr José Covarrubias, Assistant Professor of Agriculture Sciences at the University of Chile. "These iron 'chelators' can be released directly from the roots, or from microbes that grow among them, and allow the iron to be absorbed." "Blueberries, however, lack these adaptations because they evolved in uncommonly wet, acid conditions which dissolve the iron for them." As a result, most of the world's relatively dry or alkaline ('limey') cropland is unsuitable for optimal blueberry growth. "Iron is essential for the formation and function of plant molecules like chlorophyll that allow them to use energy," Covarrubias continues. "That's why iron deficiency shows up as yellowing leaves - and drastically reduces plant growth and yield. "And in blueberries, iron-dependent enzymes also produce the 'superfruit' antioxidants responsible for their celebrated blue skin and health-enhancing effects." Strong blueberries must pump iron - but at what cost? There are two approaches to correcting iron deficiency in blueberries: acidify the soil, or add synthetic iron chelators. Each has its drawbacks, says Covarrubias. "The commonest industrial approach is soil acidification using sulfur, which is gradually converted by soil bacteria into sulfuric acid. The effects are slow and difficult to adjust - and in waterlogged soils, hydrogen sulfide might accumulate and inhibit root growth. "Acids can also be added directly via irrigation systems for more rapid acidification - but these are hazardous to farmers, kill beneficial soil microbes, and generate carbon dioxide emissions. "A commoner strategy among growers is application of iron bound to synthetic chelators - often sold as 'ericaceous fertilizer' - but these are very expensive and leach potentially toxic chemicals into the water table." A cheaper, safer alternative is needed for efficient large-scale blueberry production. Thankfully, one already exists. 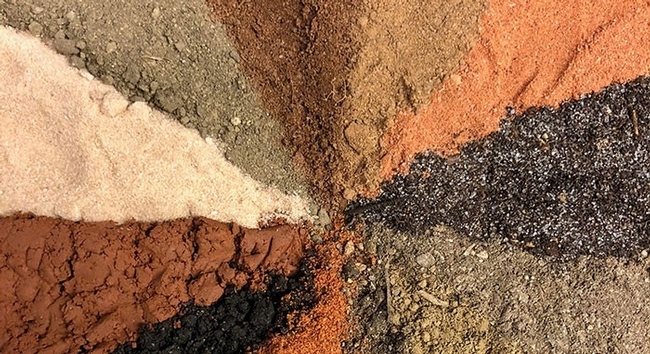 "Grasses - which are well-adapted to poor soils - can provide a sustainable, natural source of iron chelators via their roots when grown alongside fruiting plants. Intercropping with grass species has been shown to improve plant growth and fruit yield in olives, grapes, citrus varieties - and most recently, in blueberries." Now, Covarrubias and colleagues have brought intercropping a step closer to the mainstream of blueberry cultivation. For the first time, they measured the effects of different methods of iron chelation on antioxidant content and other fruit qualities in blueberries. "In an orchard of 'Emerald' blueberry bushes cultivated in alkaline (pH 8) soil, we compared the effects of five different iron chelation treatments: a 'gold-standard' synthetic iron chelator (Fe-EDDHA), intercropping with grass (common meadow grass or red fescue), cow's blood (Fe-heme), or no treatment (control)." "We found the association with grasses increased not only the total weight and number of blueberries per plant, but also the concentration of anthocyanins and other antioxidant compounds in their skins, compared to control. The effect sizes were comparable with the proven synthetic chelator Fe-EDDHA, whereas applications of Fe-heme from cow's blood - a fertilizer commonly used in home gardens - had no significant effect." A potential limitation of intercropping observed in the study was a decrease in berry firmness, since firmer berries are favored by consumers. "The association with grasses decreased berry firmness compared with control plants, whereas the berries collected from plants treated with Fe-EDDHA reached intermediate values. "However chemical analysis showed a non-significant trend towards increased ripeness in the berries collected from the intercropped plants, which could account for this small difference." Intercropped plants also required an additional water supply to maintain a similar soil moisture to other treatments, but plant management was otherwise straightforward and the same across groups. The grasses were kept cropped between 5 and 15cm - a typical range for an attractive mown lawn. "Our findings validate intercropping with grasses as a simple, effective, sustainable alternative to standard iron correction strategies in blueberries," concludes Covarrubias. "Both commercial and private growers can put this strategy to use right away to boost their blueberry crop and antioxidant content." 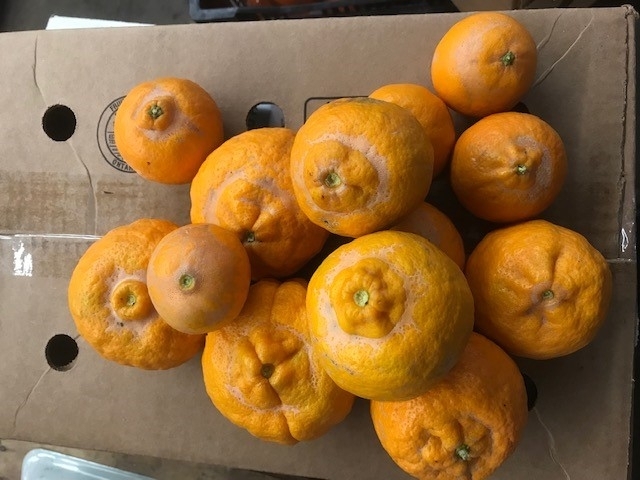 A local Ojai grower asks why there seems to be more citrus thrips damage to 'Pixie' mandarins this year. Was it because of the extended bloom due to warmer spring last year? The hotter summer up there that was more similar to climate in the Central Valley? Was it due to the Area-Wide Spraying for Asian Citrus Psyllid - ACP? Or is this a remnant of the Thomas Fire that dumped ash all over the county, disrupting biocontrol agents like lady bird beetles? And what else does fire do to citrus? This is classic thrips damage. In this area, it is not usually a problem. This year it seems to be more common. It's not always clear what is the main cause of and what all the interactions are that lead up to an outbreak like this. Just that there is damage now that occurred 10 months ago. How Wierd Can Lemons Get? 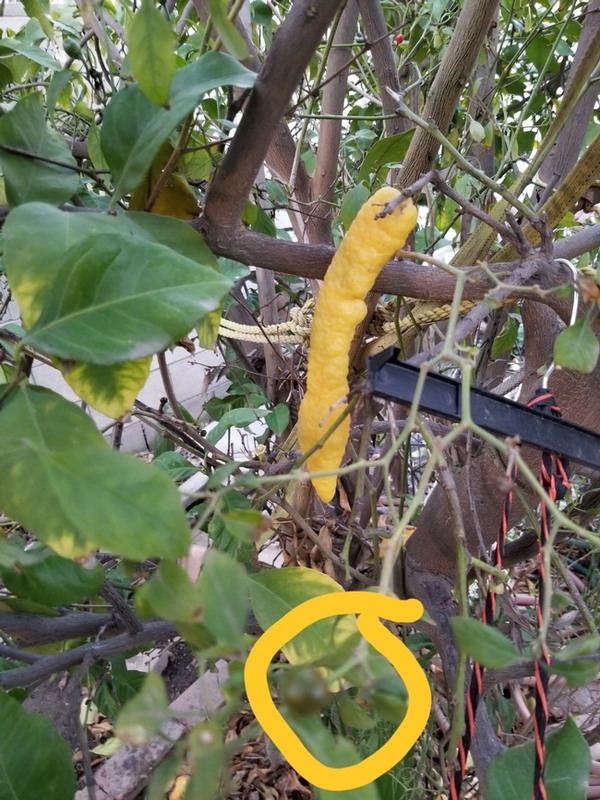 a grower sent an image of what I thought was a blurred view of something that was circled. I responded saying that I couldn't make it out, and a better image should be sent. The grower resent the image, but this time it was about the long yellow thing in the background that was being asked about. 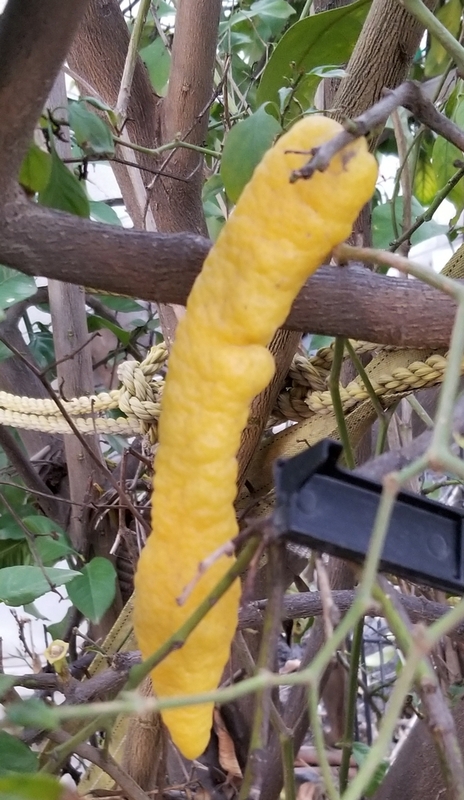 The tree is planted next to a chile pepper plant and the question was whether the shape was affected by the chile proximity. The grower had never seen anything like it before and I haven't either. But rack it up to the high temperature wave during flowering and the rapid fruit growth period and hormones gone amuck. if temperature extremes become more common, unusual fruit shapes will likely become more common. There's so much gloom about the fate of citrus in Florida and California, but in spite of that talk, world citrus production is increasing. Global orange production for 2018/19 is forecast to expand 4.2 million tons from the previous year to 51.8 million as favorable weather leads to larger crops in Brazil and the United States. Consequently, fruit for both fresh and processing uses is expected to be greater. Fresh exports are forecast 4 percent higher to 5.1 million tons. Brazil's production is forecast to rise 13 percent to 17.8 million tons as favorable weather is expected to result in good bloom and fruit set. Fresh orange consumption and exports are flat while oranges for processing are up 2.0 million tons to 12.8 million. lower on overall reduced supplies. South Africa and Egypt are the top two suppliers, accounting for 60 percent of imports. U.S. production is forecast to recover, jumping 41 percent to 5.0 million tons due to favorable weather. Orange production in Florida has been declining for years due to citrus greening, which has decimated groves and increased costs for crop maintenance. However, last year, the industry also suffered from damages caused by Hurricane Irma. This year's higher forecast shows a recovery to recent-year levels. Exports, consumption, and fruit for processing are all higher with the larger crop. 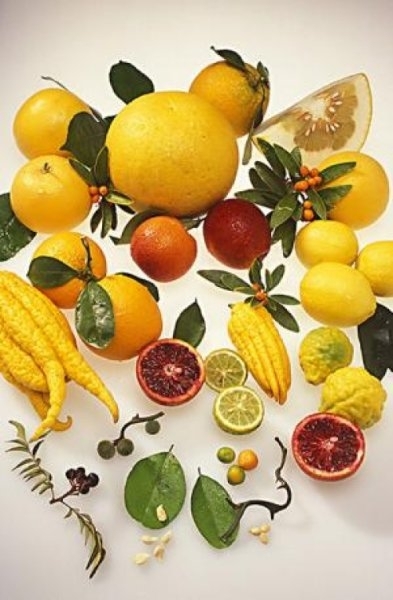 FAS Reports from Overseas Offices The Citrus: World Markets and Trade circular is based on reports from FAS Overseas Posts since December 2018 and on available secondary information. Individual country reports can be obtained on FAS Online at: http://gain.fas.usda.gov/Pages/Default.aspx .